This painting is mentioned in The Post and Courier article below and can be found here. Charleston has long been known as the birthplace of golf in America, with its roots dating back to 1743. But a researcher at the National Archives of Scotland has discovered that golf arrived in the port city four years earlier than previously thought. A document dated June 29, 1739, mentions golf clubs shipped from Scotland to Charleston businessman William Wallace in “Carolina” at a payment of 1 pound, 18 shillings (about 200 pounds or $350 in today’s market), said Scottish historian and author Dr. David Purdie. Purdie was in Charleston to make a presentation Monday night to the local St. Andrews Society, a philanthropic organization of which Wallace was a member. 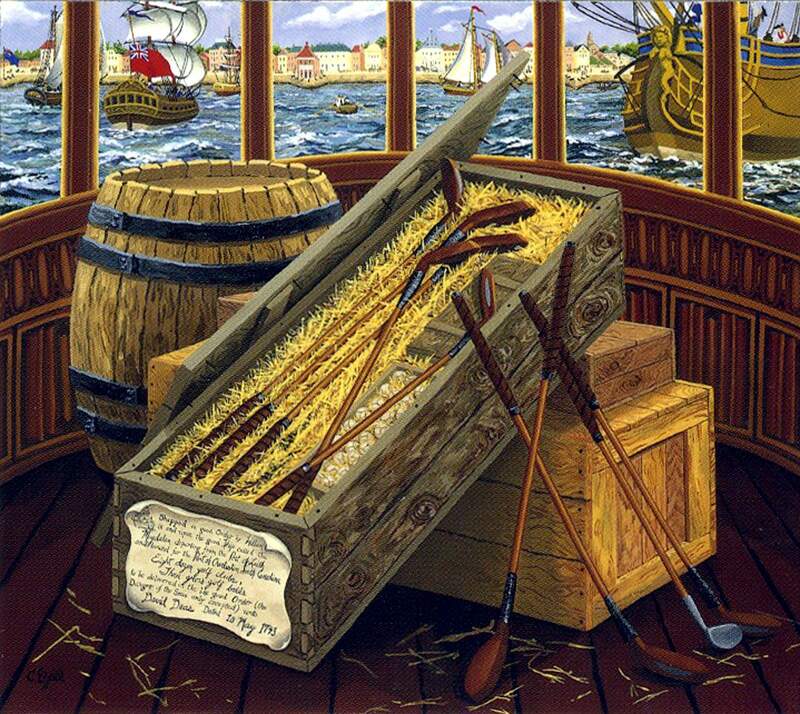 The previous earliest golf link between Scotland and America was 1743, when 432 balls and 96 clubs were shipped to Charleston businessman David Deas. Purdie said he learned of the 1739 document through a phone call. “Because I was involved in checking out the 1743 shipment, the researcher at the National Archives of Scotland called and said, ‘You have to come down here. We have seen something you will be interested in,’ ” said Purdie, a Fellow of the Institute for Advanced Studies in the Humanities at the University of Edinburgh. Charleston artist Carol Ezell-Gilson immortalized the early arrival of golf with a 1990 painting commissioned by Golf Expo 1990, a festival planned to capitalize on the rediscovery of golf in Charleston with the upcoming 1991 Ryder Cup Matches at Kiawah Island. The expo lasted only one year, but brought about renewed interest in Charleston’s place in golf history. 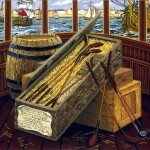 Ezell-Gilson’s painting, titled “First Shipment of Golf Clubs to America,” depicted wooden clubs in a crate arriving in Charleston Harbor. Other ships can be seen in the background, and the bill of lading is attached to the crate. With the arrival of clubs and balls, the popularity of the game increased. The South Carolina Golf Club was founded in 1786 at Harleston Green on the Charleston peninsula, at the corner of present-day Pitt and Bull streets, just south of the College of Charleston’s present-day Addlestone Library. The golf clubs, Purdie said, were wooden – hickory shafts with perhaps hazel heads. The balls were featheries, pieces of leather stitched together with a small hole left in which goose feathers were stuffed. Caddies would carry an assortment of clubs for the golfer; golf bags were still to come. Golf in Scotland dates back nearly 600 years. Musselburgh Links in Scotland bills itself as the world’s oldest golf course and was located in the middle of a horse racing track, Purdie said. It is located perhaps a mile from Port of Leith, where both shipments would have made their departure to bring golf to Charleston and to America.